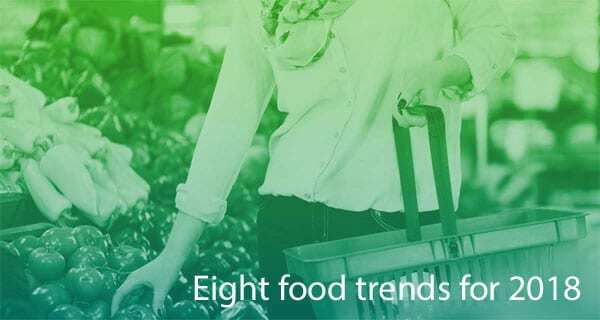 Euromonitor International has released the eight most influential packaged food megatrends for 2018. These megatrends, sharing common drivers, have the power to transform and disrupt entire categories while also providing sustainable growth and relevance for companies that succeed in these new ideas. 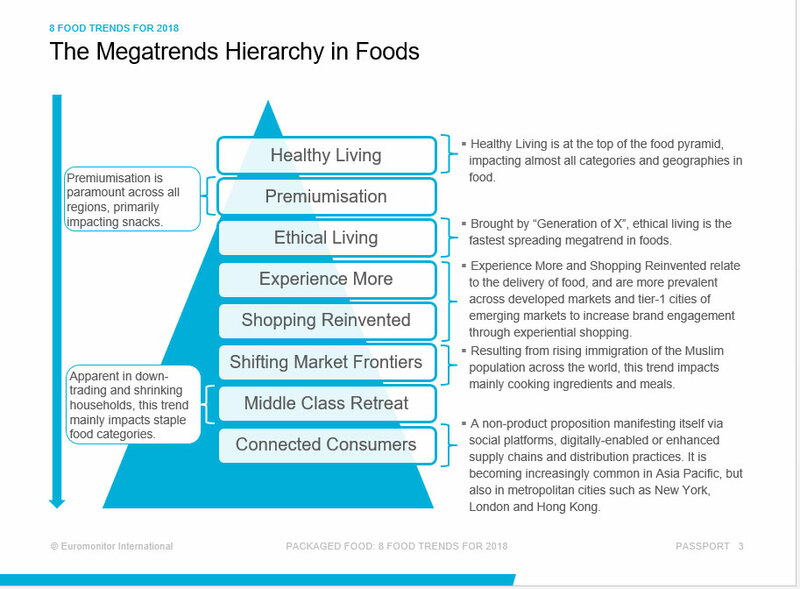 Of these eight megatrends, Healthy Living stands out as the biggest relevance for and impact on foods. The Healthy Living trend can be described in two sub-trends: Back to Nature and Naturally Functional. The food industry continues to shift its focus from weight management to nutrition and natural wellbeing. The industry has seen a rise in “Back to Nature”, defined as so-called “raw foods” – uncooked / unprocessed without being heated above 48˚C to preserve most of the natural vitamins and minerals. With sugar becoming the new villain in the obesity debate, savoury snacks and healthy fats and grains have made a comeback. Meanwhile, the “Naturally Functional” centers around the big trend of gut health, which has links with mental health and performance. The rise in this trend concentrates on 1) fermented food, 2) ancient grains and probiotics, and 3) healthy fats. Indulgence is and will always be a core driver in foods. However, it is changing shape and form, as consumers crave different products for different occasions and in different geographies. Redefining Indulgence has been changed through ingredients, health, ethics and flavour. Brought by “Generation X”, ethical living is the fastest spreading megatrend in foods, with 30% of consumers reporting that they are shopping local. There is a new emphasis on plant-based and origin foods that utilise plant protein, insects, food waste, or origin foods and provenance. From Buying to creating, consumers’ emphasis is shifting from possession to experience. By 2021, modern grocery (supermarkets and hypermarkets), will account for less than half of the total consumer goods trade. In food, modern grocery is still very important, but especially in Western markets, alternative business models such as subscription services and online/offline hybrids are showing strong growth. Resulting from rising immigration of the Muslim population across the world, this trend impacts mainly cooking ingredients and meals. Food trends tend to track migration, so 2018 is likely to see an uptick of Syrian and Middle Eastern-inspired flavours in Western markets. Halal food is another area to watch. Mainly impacting staple food categories, this trend is becoming more apparent in down-trading and shrinking households. The number of single-dad families in the US has doubled in the last 20 years. Meanwhile, wealth inequality is worsening, with low-income groups across the world growing at a much faster rate than a decade ago. Becoming increasingly common in Asia Pacific, but also metropolitan cities such as New York, London and Hong Kong, the trend of a non-product proposition is manifesting itself via social platforms, digitally-enabled or enhanced supply chains and distribution practices. A favourite buzzword for 2018 is disruption. Disruption has prompted multinational companies and legacy brands to acquire start-ups or launch their own innovation labs. These disruptive brands tend to simultaneously tap into several megatrends and are agile and responsive to consumers’ changing needs; as such, they innovate rapidly. They might create their own niche category, topple a legacy brand in an existing category, adopt a new technology, or disrupt through a novel marketing or channel strategy.